Perfumes. I am a total sucker for them (as I'm sure you guys are too!). I have so many and sometimes it is actually a struggle choosing what to spritz myslef with in the moring - total first world probem I know. It is so easy to sell me on a perfume - and that's without even smelling it, name, brand, bottle - they are just so pretty! I can't help but keep buying them and I'm always finding new favourites - like this little beauty.... Vivienne Westwood's Cheeky Alice. This is my first ever perfume post here on A Yellow Brick Blog - I always thought it would be difficult to describe a scent... with no smells but - I'm going to try my hardest... as this is a beauty! This is the 50ml Cheeky Alice eau de parfum - for those of you that aren't sure what that means ... the easiest way to put it - it is stronger than an eau de toilette. EDT's are like watered down versions of EDP. The first thing at attracted me to this fragrance was the name. Cheeky Alice. 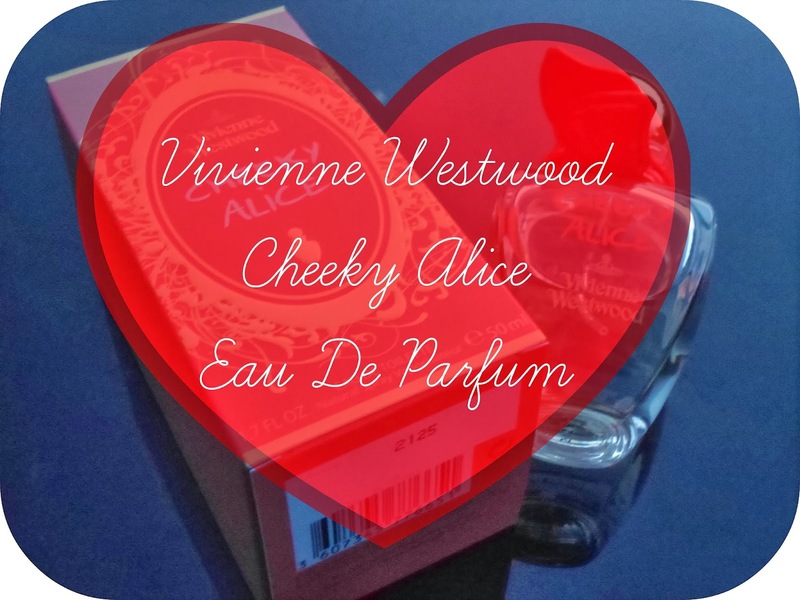 It seems young, tongue in cheek, fun and flirty and as I already knew that I loved the scent of Naughty Alice - I hoped this one would be well up my street aswell. Simple and elegant - I love the shape and style of this bottle and the fact the product is clear - I always prefer a clear perfume! Yes it isn't as loud and jazzy as alot of other perfumes out there but I personally love the chic and sophisticated look of it. Not only that but it is super easy to hold AND it looks great on my dresser! Along with all that it comes with the gorgeous red patent bracelet wrapped around the neck. Now it is hard (for me) to describe a scent via the means of typing on the internet so I thought I would give you guys the official description of the beaut to help you (and me) out! I feel like this scent is actually a little more mature than some of the other perfumes I own and wear (*cough*Britney*cough*Taylor*) which is one of the reasons I am loving it so much. The only other perfume I've had that is similar to this is probably Hugo Boss Femme - a personal fav of mine. Personally I love it for both daytime and evening, it is totally wearable for either. I suppose that is individual preference but I don't think it is too heavy and overpowering for a cute daytime scent but it is still glam enough to wear out on a night out. The best of both worlds. I having been wearing this literally non-stop since receiving it and am totally and utterly in love. New signature scent? I think so! Check it out here. Have you guys bought or tested this yet? I highly recommend having a little spritz the next time you are floating around a perfume counter! I loved the 'Naughty Alice' fragrance and this sounds just as gorgeous! I love the packaging. I like the design off this bottle, I must have a sniff next time i'm out.